"In Turner’s meticulously detailed . . . book, he postulates that Brand was an idealistic (albeit Barnum-esque) leader of a merry band of cybernetic pranksters who framed the concept of computers and the Internet with a seemingly nonintuitive twist: These one-time engines of government and big business had transmogrified into a social force associated with egalitarianism, personal empowerment, and the nurturing cocoon of community." "Turner’s fascinating From Counterculture to Cyberculture gives us a detailed look at one slice through this marvelous story. Unlike many other histories that focus on the technical innovators . 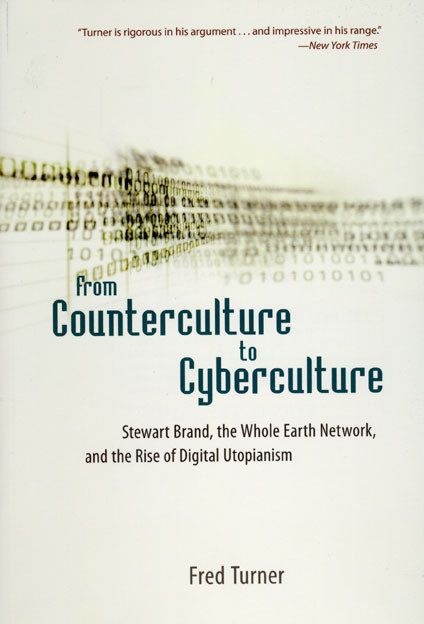 . . this account focuses on a key player whose role was making the counterculture-cyberculture connection: Stewart Brand. . . . There are a myriad of fascinating little historical details that [Turner] dug up that will surprise and enlighten even the key players in the drama." "Brand’s trajectory from arty 60s mayhem to the halls of Congress reflects, Turner argues, a realisation that ’the natural world and the social world really were all one system of information exchange.’"
"With its countercurrents and nuances, [the book] recalls works of the highest standard that also address technology’s interactions with national culture: David E. Nye’s "American Technological Sublime" (1994) comes to mind, as does Norman Mailer’s ’Of a Fire on the Moon’ (1971). . . . One of the many strengths . . . is that [the book] articulates the sociological forces that created this revolution in our time. Twenty-nine dollars will never buy you more book than this." "The links this book makes between the world of the counterculture and the world of high technology make it important reading for anyone teaching or writing about the 1960s." "[The book] fills important gaps and connections in how the Internet and computer world evolved beyond its business and military applications to include the rest of the world, and is a fascinating read." "From Counterculture to Cyberculture is essential reading for anyone who wants to understand the new economy and from whence it came. This is a book that belongs in both graduate and undergraduate classrooms, not just for its scholarly message but for the deep chill it leaves behind." "A compelling history of a critical individual and his circle. . . . For professionals in the field of information dissemination and management, much can be learned by reading this fascinating and highly recommended study." "This tale of cultural changes and personalities involved with the evolution of computer culture is well worth reading." "A foundational text. . . . [What] scholars will find is a thorough and thoughtful history of how the anti-establishment, communitarian dreams of a segment of the sixties counterculture were uploaded into the high-tech ethos of Silicon Valley, and from there into the world at large." "The definitive book about the Whole Earth Network as precursor of digital Utopianism and the Internet."